As Ohio's Democratic primary nears, charming Gov. 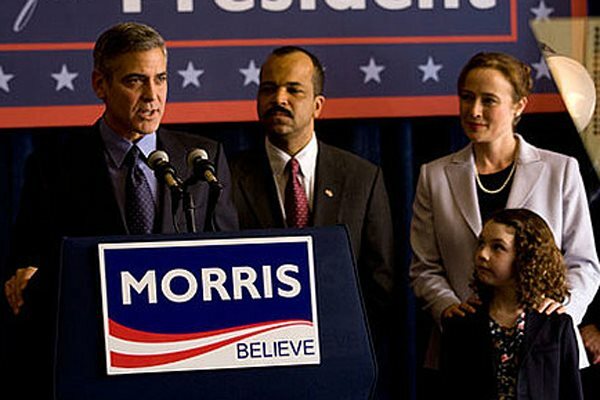 Mike Morris (George Clooney) seems a shoo-in to win the nomination over his opponent, Sen. Pullman (Michael Mantell) . Morris' idealistic press secretary, Stephen Meyers (Ryan Gosling) believes in his candidate's integrity and the democratic process. But, Meyers' meeting with Pullman's campaign manager (Paul Giamatti) and a dalliance with a young intern (Evan Rachel Wood) set in motion a chain of events that threaten Morris' election chances. 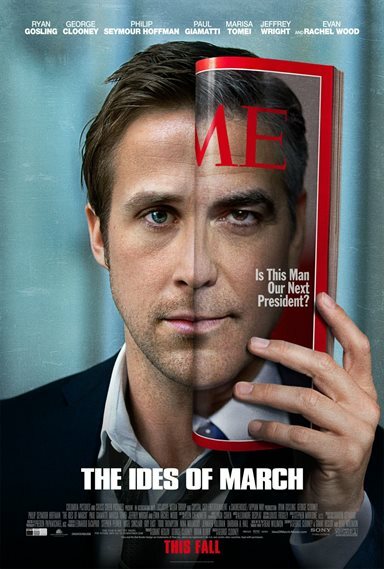 Download The Ides of March in Digital HD from the iTunes store. The Ides of March images are © Warner Bros.. All Rights Reserved. Given the terrible state of our economical and political landscape at the moment, a film like The Ides of March could not have come at a better time. The movie tells the fictional story of a Presidential candidate and his team while they attempt to make a successful run for the White House. 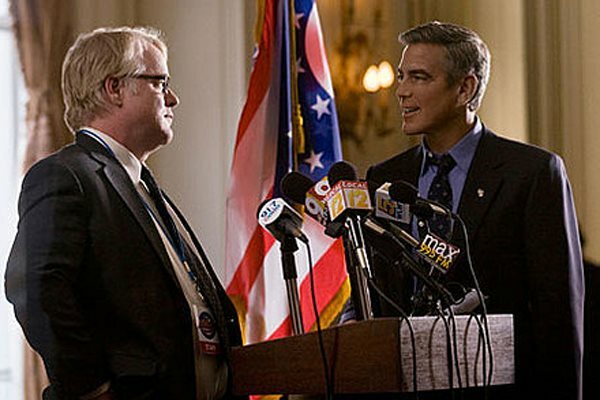 George Clooney plays Governor and Presidential Candidate Mike Morrison; when the film opens we are treated to newspaper clippings and posters of his well sculpted face as he sets out to get the Democratic nomination. As potential candidate's go, you can't get much better than Clooney's character, of course he was written that way but given his natural charisma on screen he does a phenomenal job of selling you on his political beliefs. Stephen Myers (Ryan Gosling) is Morrison's political media consultant, who is an idylistic and rising star inside the political world. Everyone in this arena is aware of him and is excited to see what he will do next. Myers works directly under Paul Zara (Philip Seymour-Hoffman) the campaign manager and their direct rival is Tom Duffy (Paul Giamatti). Duffy is working for Morrison's opponent, whom we never really see, but are fully aware through Giamatti's character. Marissa Tomei plays Ida Horowitz, a political reporter for the New Yorker who is eagerly covering Morrison's campaign. The film mainly follows Gosling's character as he slowly learns the realities of operating within the political landscape. At the moment the Ohio Primary is looming and the entire staff is working out of Cincinnati. One of the staff members, Molly Stearns (Evan Rachel Wood) makes a pass at Stephen one day and like any young enthusiastic male, he accepts. Their encounters are passionate and fun but Myers makes it clear from early on that while he likes her, his main passion is politics, especially Morrison. It isn't difficult to see why considering how well voters respond to Morrison's charm. Of course things never stay quiet and peaceful in politics and one day Molly drops a bombshell on Stephen regarding Morrison. What that news is will have to remain a mystery for audiences but when Myers hears this news he knows that it isn't something that can be quietly ignored. At the same time Stephen is being courted by Tom Duffy to switch sides and work for them. With so many people pulling at Myers from so many different directions it is hard for him to not become affected by all that is happening. A cauldron of conflicting genuine and perceived realities is brewing; what will be the result? This is a fine film with superb directing and performances from everyone in it. Clooney once again proves that he has the chops to play any role handed to him as well as direct. Gosling is clearly a Hollywood star on the rise, this being his third film to come out in almost 4 months. Paul Giamatti and Philip Seymour-Hoffman are fantastic as always and Evan Rachel Wood does a great job of pulling just the right blend of innocence and pity. Really, the only negative to this film is the genre itself. It is one of the few adult dramas that have come out this year. So many films now are big budget blockbusters that are only geared to turn a profit. This is what may hurt the film because so many audiences now are eager for those blockbusters; any film with too much plot and not enough action can become lost in the mix. It is for certain though that the film will receive a lot of critical success and may even garner an award or two. Perhaps with the right media consultant, the film might even make some money. 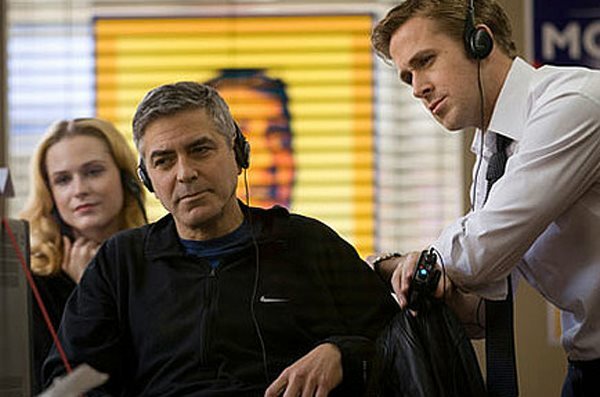 The Ides of March images © Warner Bros.. All Rights Reserved.